See the project for a statue to Jules Durand. Donate! 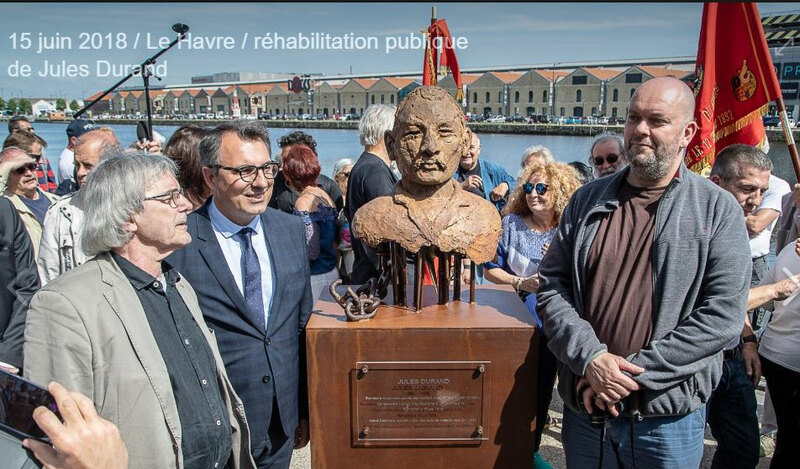 Jules Durand (1880-1926) was a French longshoreman who led a strike of coal-porters in Le Havre in 1910, and was condemned to death after a frame-up organized by the Compagnie générale transatlantique, the leading shipper. His defense was organized by the dockers’ union, the local labor council (at the time, only one union existed in France, the Confédération générale du Travail (CGT)), a committee to defend Jules Durand, the national CGT and the Ligue des Droits de l’Homme (LDH). Their appeal was transmitted by Herman Jochade, at the time secretary of the International Transportworkers Federation (ITF), and a worldwide campaign of trade union motions, demonstrations, strikes and petitions was launched. The campaign was successful in freeing him and obtaining a discrete formal rehabilitation in 1918. But the cruel treatment he received while awaiting the guillotine (straightjacket, hood and shackles) had undermined his lucidity and he finished his life in a psychiatric asylum. His funeral in Le Havre in 1926 was followed by tens of thousands of people. His memory was celebrated locally by unionists. Jules Durand could be considered as the French « Joe Hill ». His cause was reactivated in 2012 by the foundation of the association « Amis de Jules Durand ». June 15, 2018 will be the hundredth anniversay of his judicial rehabilitation and the association is planning a series of events to commemorate the event.